Makoto Shinkai is an epoch-making anime creator, for he paved the way to independent CG anime production with Hoshi no Koe(Voices of a Distant Star). Following his last omnibus movie 5 Centimeters Per Second, Shinkai is now working on a new one. While its title and opening date hasn't been disclosed yet, this will be his first feature-length movie since The Place Promised in Our Early Days of 2004. 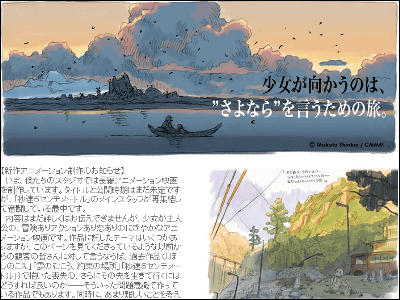 Here's a quote from Makoto Shinkai's official page. We are now working on new featured-length animation movie in our studio. There hasn't been any concrete title or opening date, but we, almost the whole crew "5cm per second", are striving for better quality. We are sorry that we can't tell you plots for now. Only things we can tell are that the protagonist will be a girl, the story will be full of adventures, swinging action and love. The movie is based on a lot of theme. Especially, we brought up an answer to how we should face life after a great loss, like the losses we told in our previous titles. Those who have watched our older titles might prefer to see it from that point of view. Of course, we're aiming for great entertainment at the same time, a fun movie for everybody. The official site for the movie will be launched soon and there will be more information. But it might take a little more time. Please be patient for the day to come. He says this notice is a quick message for the meantime. The official announcement will be made soon. Hoshi No Koe of 2002 was really a great animation, for its awe-inspiring high quality as a low budget "Independent animations", and the fact that he did almost all the work himself on 25 minute full-digital animation. Many creators in animation industry say they are influenced by Hoshi no Koe. May this new movie be another pathfinder for anime industries.